The proposed collaboration between DSAM and Nanyang Siang Pau that was mentioned in September’s e-bulletin has taken off on 9th November 2010. 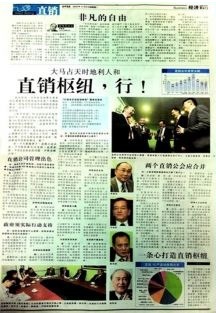 The weekly page featuring the direct selling industry shall be on every Tuesday in Nanyang’s Business section. One of the many benefits for DSAM members in this collaboration is that one DSAM member shall be featured every week. Interviews with DSAM member companies have begun. The selection of which company to be featured first is totally at random with no prejudice on company size, length of membership, sales turnover or even alphabetical. For more information on this,click here.